Madonna is hoping to make David Banda a big brother as she attempts to adopt another baby from the African nation of Malawi. Madonna is about to add another tyke to her brood. The Queen of Pop has filed papers to adopt another child from the African country of Malawi, E! Online reported. Madonna previously adopted son David Banda from the nation in 2006 after a visit to the region earlier in that year. She has two other children, Lourdes and Rocco. Malawi officials said earlier this week that Madonna's hot and heavy flings with steroid-enhanced New York Yankee Alex Rodriguez and half-her-age Brazilian model Jesus Luz could hinder her chances of adopting again. The singer's "broken" home life wouldn't be a good place to raise children in, adoption experts in Malawi said in reference to Rodriguez, Luz and director Guy Ritchie, who Madonna recently divorced. 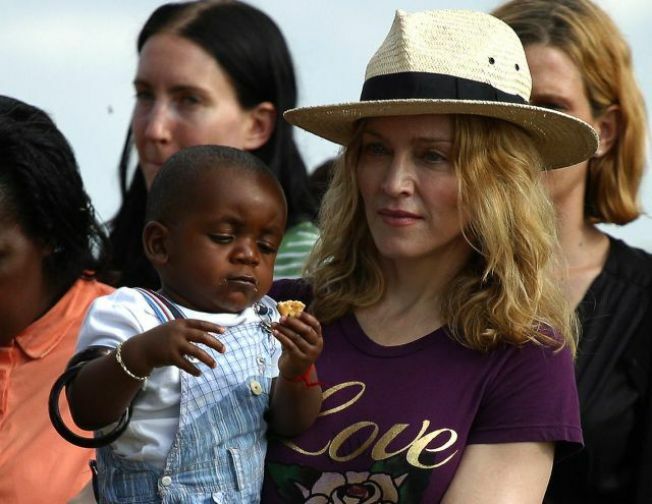 Madonna's latest adoption case could go before courts in Africa as early as Monday, officials said. Madonna's rep had no official comment about the story, but Malawi higher-ups said they expect the "Like a Virgin" star to appear in the country within the next few weeks. "We expect her over the weekend or earlier than that…but without a doubt she is coming before the end of this month," an official from the nation's Ministry of Gender and Child Development told Reuters, according to E!.